The Aérospatiale Gazelle is a French five-seat helicopter, commonly used for light transport, scouting and light attack duties. 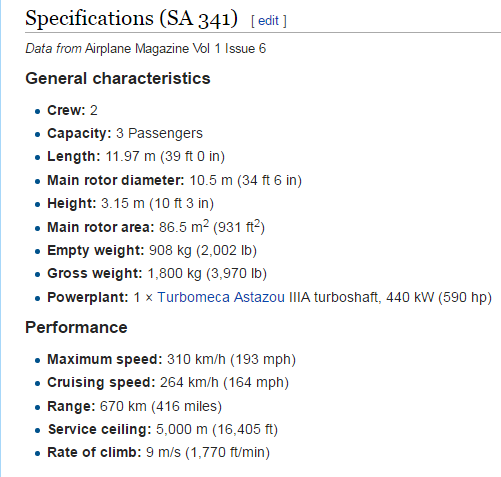 It is powered by a single turbine engine and was the first helicopter to feature a fenestron tail instead of a conventional tail rotor. It was designed by Sud Aviation, later Aérospatiale, and manufactured in France and the United Kingdom through a joint production agreement with Westland Aircraft. 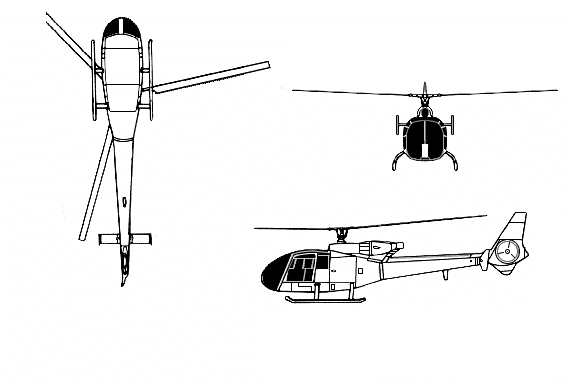 Further manufacturing under license was performed by SOKO in Yugoslavia and the Arab British Helicopter Company (ABHCO) in Egypt. 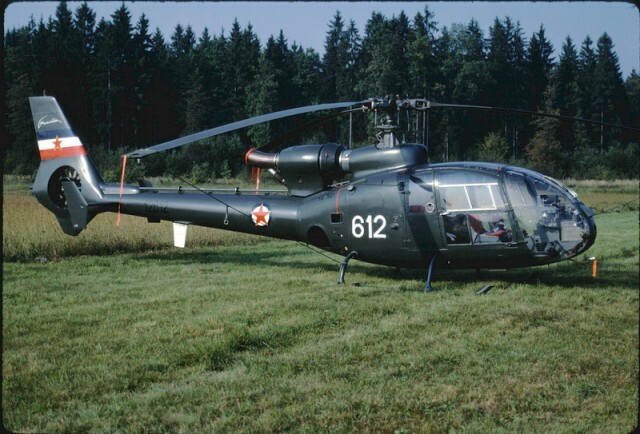 Yugoslavia at the beginning of the 70s of the 20th century showed interest in the purchase of the helicopters. In 1971 signed a contract for licensed production. It was initially a partial license with the cooperation to accelerate the production and introduction into weapons. 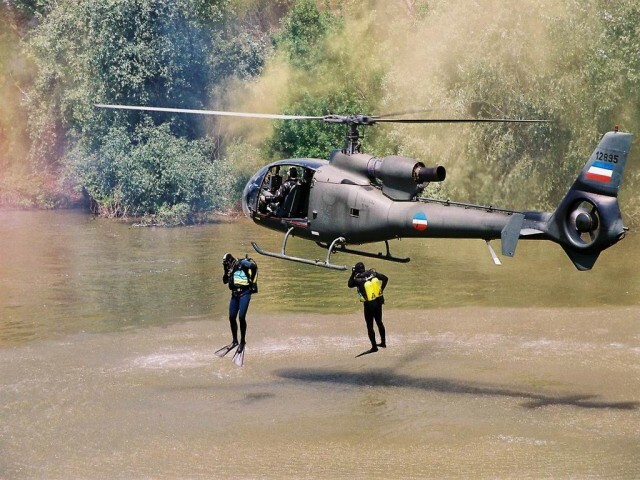 The first of 21 helicopters was purchased in France in version SA-341G and arrived in the period from 1973 to 1976. Helicopters ev. number 12609-614 were assembled in Yugoslavia get local factory numbers. The license production of 1978 begins in the factory SOKO Mostar while the engines 'Astazou IIIB' 'manufactured in the factory' '21. May '' in Rakovica. First Yugoslav copy of the ev. number 12615 was submitted to the examination of December in 1978. A total of 94 helicopters variant SA-341h were produced. The overhaul was conquered in the Air Force Institute '' Moma Stanojlović '' at Batajnica. SOKO factory has produced 63 additional helicopter variants SA-342L with a more powerful engine '' Astazou XIVM ''. Of these 20 were invariants HO-45 (helicopter-basic, ev.) And 43 HN-45M GAMA (helicopter-armed). Reconnaissance Hi-42 HERA intended for correcting artillery fire, of equipment have built-Yugoslav system '' Hera '' made on the basis of the French gyro stabilized platforms-tombstones APX-334-25 with a laser rangefinder, radio altimeter and Doppler navigation system Doppler 80 / RNS 252. this system enabled the accurate flight to the foregoing points of observation, accurately determining the position of objects facts and data delivery artillery units. All variants of the Gazelles can have cranes' 'Breeze' '(breeze), or' 'Air Equipment' payload of 136 kg. There is also a device for carrying external loads where the helicopter fitted padded lock capacity 700 kg. 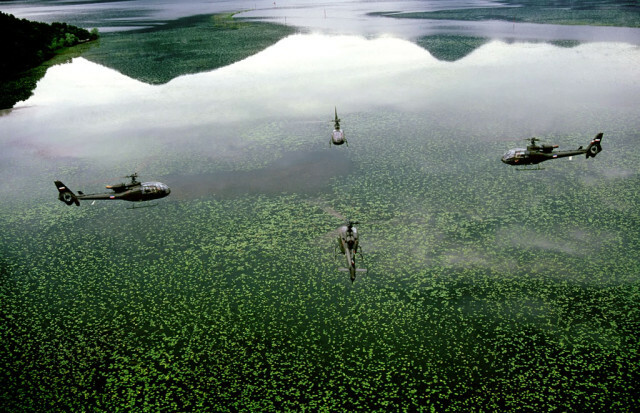 For all unarmed Gazelle can be installed and the floats emergency in landing on water. 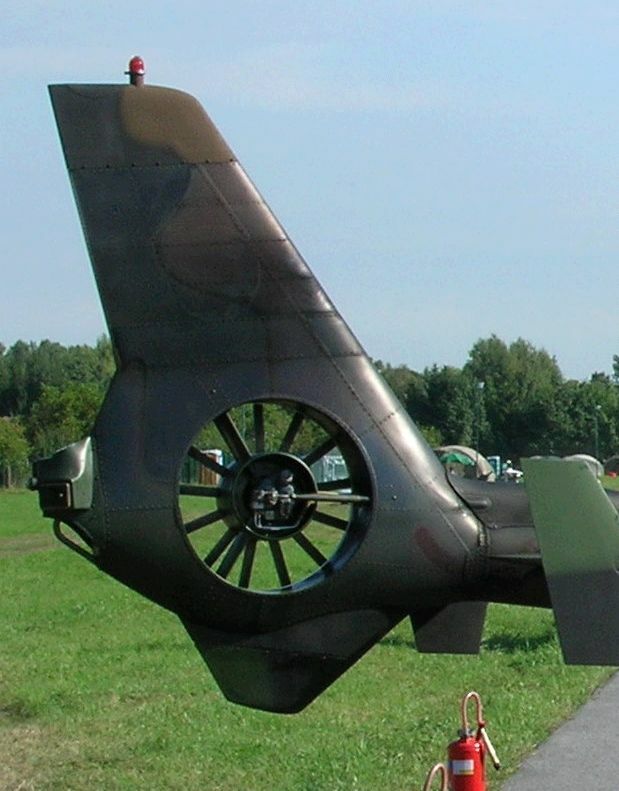 Specially developed variant GAMA (Gazelle-Maljutka) is designed for combat against and the fact the low-flying planes and helicopters in the air. 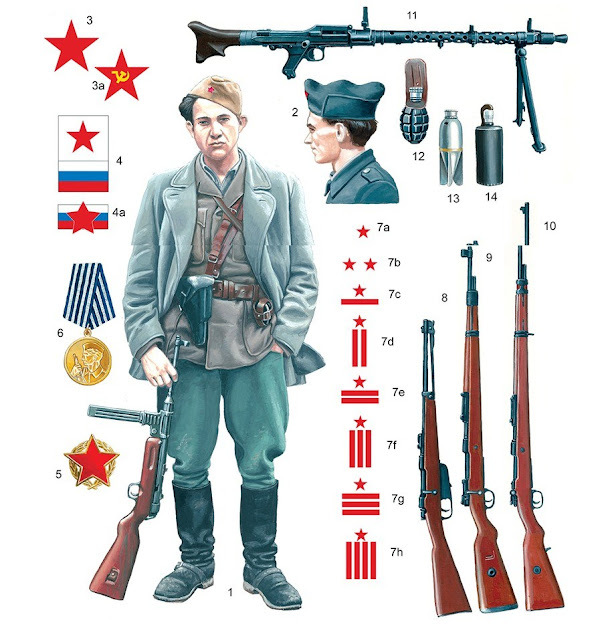 The system consists of weapons gyro-stabilized sight APX-334, collimator sight, craft tube with arms carriers, and systems for the fact with anti-armor rockets 9M14M '' Maljutka '' and the anti-missiles' Strela-2M ''. 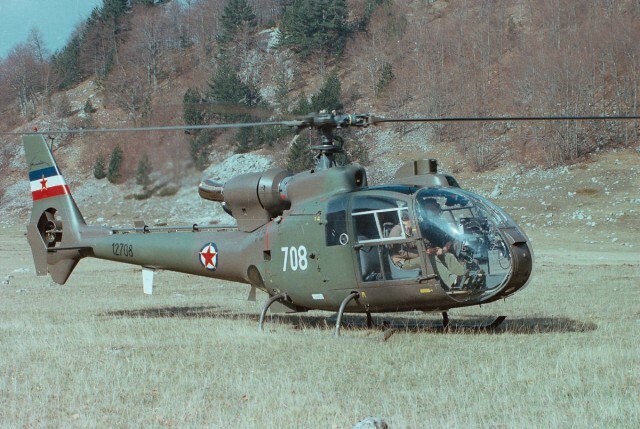 The first unit equipped with Gazelle were 782i 783. helicopter squadron, the 107th helicopter regiment at the airport Ortiješ near Mostar in 1973. During the '80s with Gazelle were equipped squadrons in Rajlovac, Batajnica, Nis, Divulja etc. 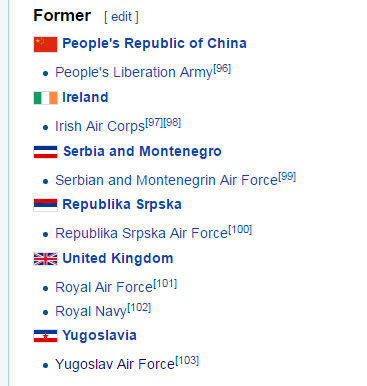 At the beginning of the war in 1991 helicopters were also part of the 97th Regiment of Mostar and in a staff department of the 1st Corps of the Air Force. During the disintegration of Yugoslavia, Gazelles were used for almost all tasks that may have to do. 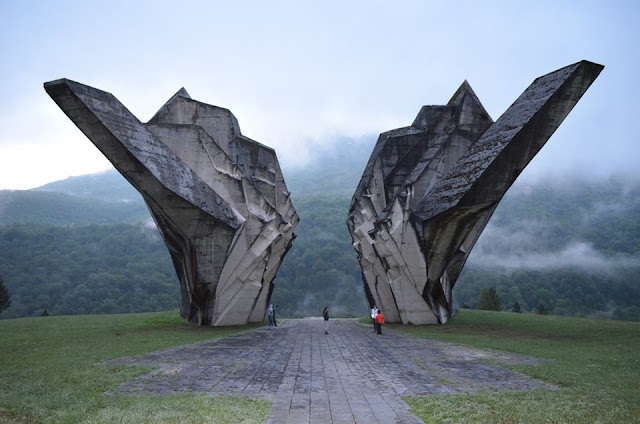 JNA in this operation lost four helicopters and one helicopter pilots kidnapped the Slovenian nationality that was later used in the composition of the Slovenian Air Force. 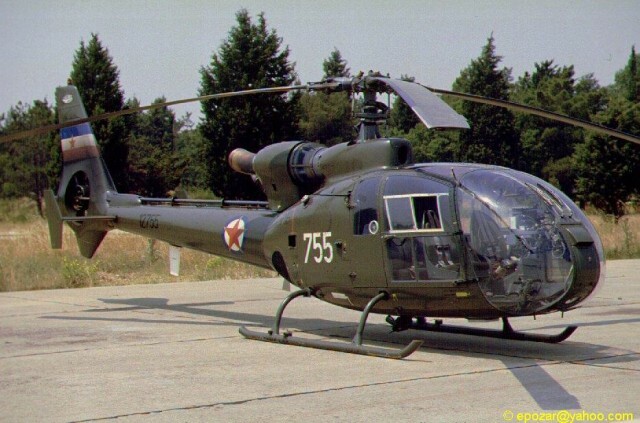 After the withdrawal of the JNA from the territory of Croatian and Serbian Republic of Bosnia and Herzegovina in the rest of the 27 Gazelle (including 20 GAMA) and the Republic of Serbian Krajina used several of these helicopters. 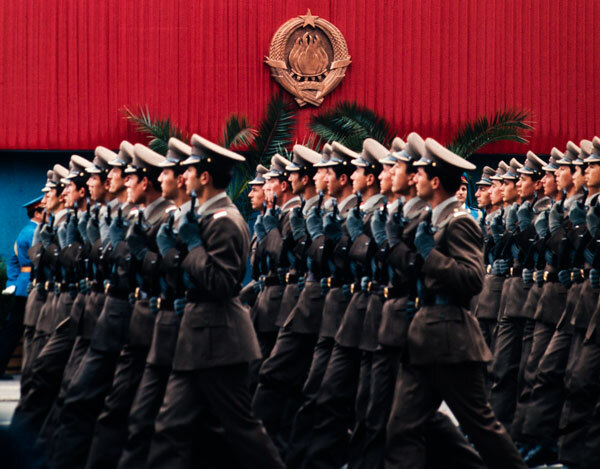 A large number of helicopters, about 130, after 1992, found in the composition of the newly formed the Air Force of the Army of Yugoslavia. 1997 pilots of the 897th Mixed Helicopter Squadron 172 aviation brigade from the airport Golubovci established a helicopter acro-group '' Hornets' on 4 helicopters. The first public performance was also at the international air show in Batajnica in 1997 and at that time showed a remarkable twelfth-minute program. Next, even better performance was also at the next air show Batajnica 1998. 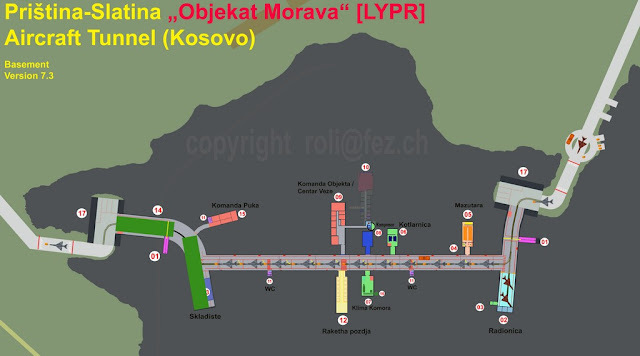 During the 1999 bombing on the ground has suffered only one gazelle and to the airport Golubovci. during the bombing of Yugoslavia, Gazelles were engaged primarily for reconnaissance and connection as well as in search and rescue pilots downed Yugoslav fighters.